Nicola grew up in Windsor, Ontario. She attended the University of Windsor and completed her Bachelor of Arts degree in Criminology and graduated from the University of Windsor, Faculty of Law, in 2009. Nicola was actively involved in the Family Law Information Centre during her studies. Nicola articled at Miller, Canfield, Paddock and Stone in Windsor, Ontario. She was called to the Ontario Bar in 2010. Nicola commenced practicing law in the Grey Bruce area in 2010. Nicola’s areas of focus include family law, general litigation, real estate and wills. Nicola has enjoyed learning about Bruce and Grey County. 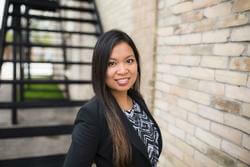 She has been involved with the Ontario Federation of University Women’s group in Hanover, Ontario. She has stood on the South Bruce Grey Health Centre Board of Directors and has assisted with the County Towne Players theatre group in Walkerton, Ontario.